The Barrow House is a pub in idyllic Egerton, a village known for its thriving community spirit as much as its magnificent views across the Weald of Kent, picturesque cottages and local history. 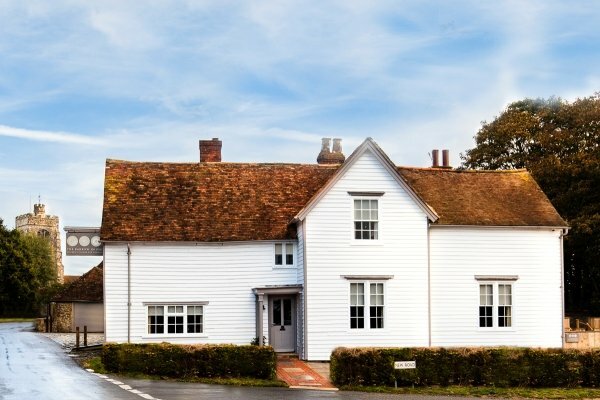 Previously known as The George, the inn was originally built in 1576 using timbers from sailing ships and traditional cob and straw plaster, which remain behind the 17th century timber frame, weatherboards and Kent peg tiles. Now owned by the team behind Sissinghurst’s popular pub, The Milk House, The Barrow House also prides itself on its food. Whether you fancy a quick snack, a light lunch or dinner with friends and family, there’s something for everyone on the menu. To wash it all down there are local beers, cask ales and a wide selection of wines by the glass. Named after the ancient burial mounds dotting the local landscape – the local area is great for walking or cycling. Fancy making a weekend of it? Upstairs there are three beautiful bedrooms, all with luxurious en-suite bathrooms and enormous beds to ensure the most comfortable overnight stay or relaxing weekend getaway. Each room has a distinct personality, but they share in common space and light with large windows looking onto the village and valley.